Dashboard is split up in two views. 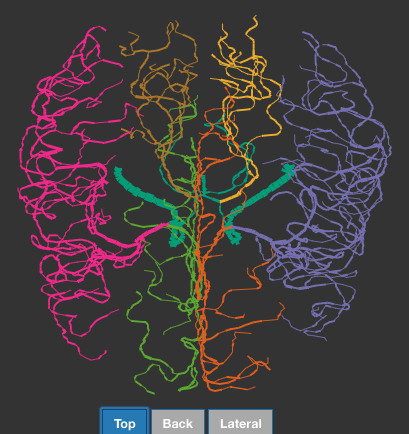 Brain view on the left and dendrogram view on the right. 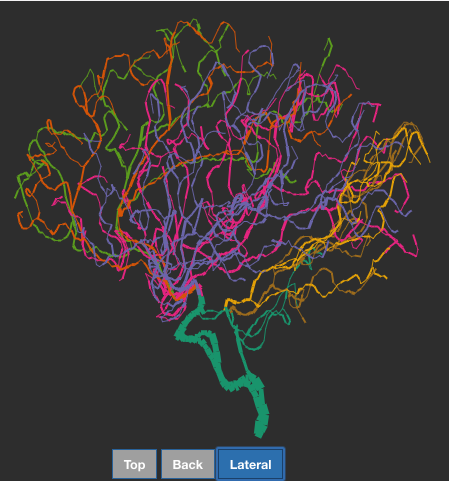 Brain view shows a 2D projection of arteries which carry blood to the brain. Dendrogram view is an abstract representation of the arteries and provides a visually less cluttered and more understandable branching within the brain arteries. 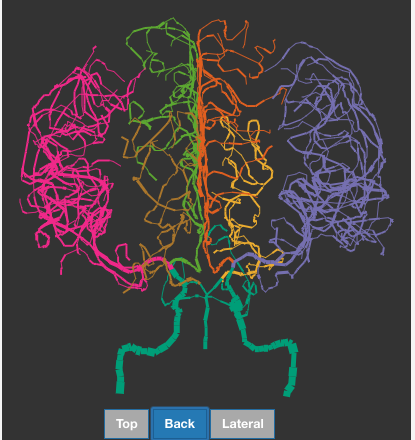 Categorical color code is used to highlight branches which supply blood to different parts of the brain. However, additional use of categorical color scale is for readability of the dendrogram. You can look at colors on the branches of dendrogram and look at corresponding color on the brain view. There are 3 views to look at 3D brain projection. You can switch the brain view using the button placed just beneath the brain. There are three dendrogram layouts; they can be switched using the buttons in the top panel. Our main task is showing blood flow in the arteries. We use a faint orange to dark red gradient color scale. Blood flow can be switched on using the checkbox at top right corner of the dendrogram view. A stroke can be identified by a sudden change in the gradient color scale.